As of June 1, John W. Johnson will become NASBA's Director of Legislative Affairs. He is the former executive director of the Florida Board of Public Accountancy (2002-2006) and has most recently served as the director of governmental affairs for the Florida Institute of CPAs, monitoring both state and federal legislation. Mr. Johnson is a member of the CPA Society Executives' Association. Working with Mr. Johnson will be the NASBA Legislative Affairs Committee, chaired by Director-at-Large Donald Burkett (SC). 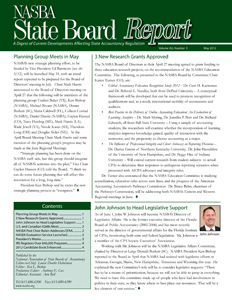 NASBA President Ken Bishop reported to the Board in April that NASBA had assisted with legislative efforts in Arkansas, Georgia, Maine, New Hampshire, Tennessee and Wyoming this year. He explained the new Committee's role will be to consider legislative requests: "There has to be a means of prioritization, because we will not be able to jump at everything. We need to have this committee made up of people who have had involvement in politics in their state, so they know where to best place our resources. That will be a key element of our success."